Electrophoresis is a process directed motion of particles dispersed in a liquid in a constant electric field. Particles of the same substance are identical in sign to the charges. - In electric field of charged particles move to the negative electrode - cathode, negatively charged particles to the positive electrode (anode. The motion of particles to the cathode sometimes called elpo, to the anode - anaphoresis. The speed depends on the mass of the particles, and the charge in these conditions, making electrophoresis allows to separate mixtures of substances into its constituent components. Risky free (front) electrophoresis. The position of the boundary of the section: a - prior experience; b - after the experience. 1 - electrodes; 2 - solvent; 3 - protein solution. The following types of electrophoresis. 1. Free (front) electrophoresis. In this case, electrophoresis spend devices, significant part of which is U-shaped tube (Fig. 1). The lower part of the tube to fill the test object, such as a protein solution that layer thinner. In the solvent immersed electrodes, connected to the constant power supply. Thus electrically charged particles protein moved to one of the electrodes, resulting in the interface between the solution and the solvent in one knee raised (rising edge), and the other goes down (falling edge). Devices for free electrophoresis, equipped with an automatic registration of moving of each component in the studied object, used in the analysis of disperse systems, the allocation of these separate components, but also in a clinical study of serum blood. 2. Electrophoresis on media zone electrophoresis). As carriers of paper used, gels starch, agar, polyurethanes etc. In clinical laboratories particularly pervasive for the study of serum got electrophoresis on paper, which is conducted in the following way: on a strip of special sorts of paper impregnated with corresponding buffer solution (see), put a drop of blood serum. The ends of the strips put in a Cup, filled data buffer solution and fitted with electrodes. When bandwidth constant electric current separate serum proteins move along the strips with different speeds, and sometimes in different directions. After a certain time the transmitting current cease, a strip of paper dried and treated with reactive protein. This paper electrophoregram identified colored spots. The number of spots judged on the amount of protein fractions, and by the intensity of colour spots - about quantitative content of each protein fraction in the serum. Lately wide use in research and in clinical diagnostics finds electrophoresis in a thin layer of gel is applied on a glass plate (disc electrophoresis)and placed in a glass tube. Electrophoretic study. Used in clinical practice zone electrophoresis for the investigation of the protein composition of body fluids. Often used electrophoresis on paper as the most simple in technique. Electrophoresis in agar and starch gels used in medical practice primarily in scientific research. Using electrophoresis on paper share in the blood protein fraction, lipoproteins, glucoproteins, and urine protein fraction, gastric juice, exudates, etc. In the blood electrophoresis identifies 5 main protein fractions: albumin, alpha-1 (alpha1) alpha-2(alpha2)-, beta (?) - and gamma(gamma-globulins. In norm, their relationship is more or less constantly. In some diseases, these ratios change that may have diagnostic and prognostic value. For example, in acute inflammatory processes increases content in the blood α2-globulin; in the period to develop immunity increases the content of gamma globulin; with liver disease is reduced the amount of albumin, etc. In certain diseases (for example, in multiple myeloma) in plasma appear abnormal proteins (paraproteins)that can be detected by using methods of electrophoresis, which is of great diagnostic value. Electrophoresis - a phenomenon directional movement ultramicroscopic and microscopic particles under the influence of the applied external potential difference observed in suspensions, emulsions, colloidal solutions, solutions of high-molecular compounds (such as proteins, nucleic acids, polysaccharides, and other). Electrophoresis is explained by the presence of microscopic and ultra microscopic particles of electric charges that arise as a result of selective adsorption of particles ions from the dispersive environment or due to dissociation of ionogenic groups that make up the surface of the particles. The electrical charge of a particle depends on the nature of particles and on the composition of the dispersion medium. Particles of the same substance can be charged both positively and negatively with the composition of the dispersive environment. So, for example, protein macromolecules in solutions with a pH less than isoelectric point of this protein (see Ampholytes), are charged positively and move in an electric field to the negative pole is the cathode, and solutions, pH which are higher than protein isoelectric point, it macromolecules are negatively charged and move to the positive pole - anode. The motion of particles to the cathode sometimes called elpo, to the anode - anaphoresis. To study electrophoresis is used several methods. The most accurate front electrophoresis, or method of mobile boundary. The devices used for front electrophoresis, different in design, but each of them includes electrophoretic cell is usually U-shaped tube (Fig. 1). The lower part of the tube is filled investigated liquid, such as colloidal solution, on which layer diluted electrolyte solution with conductivity is equal to the conductivity of a colloidal solution. In open knee tube placed nepalaikomas electrodes, connected to the constant power supply. When the current is switched on colloidal particles United front (since the particles in this colloidal solution but have the same sign electric charges) are moved to one of the electrodes, resulting in the interface between the colloidal solution and the solution of electrolyte in one knee tube rises (rising edge), and in the other knee, respectively goes down (falling edge). Moving boundary is easy to observe that if a colloidal solution dyed. If a colloidal solution of flint, the interface between it and the electrolyte solution can be made visible by lighting apparatus side; colloidal solution will opalestiruty. Sometimes for this purpose use the ability of colloidal solutions or solutions of high-molecular compounds to floorestimate under the action of ultraviolet rays. Fig. 1. 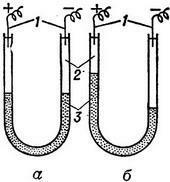 Electrophoretic cuvette (scheme): 1 - the investigated liquid; 2 - diluted electrolyte solution; 3 - electrodes. where D is the permittivity dispersion medium, H - drop of the potential of the electric field in the unit of length n - 3,14, n - viscosity of the dispersive environment and K is a constant that depends on the form of particles (for small spherical particles to, for cylindrical particles K-4). The value of the U/H, i.e. the speed electrophoretic moving particles, designed for potential drop 1 V/cm, called electrophoretic mobility. This value with dimension cm2 in-1 s-1, for proteins (near isoelectric point) is equal to 0,4-0,8·10-4, to the red blood cells of various animals - 1,0-1,7·10-4 , etc. Perfect technique front electrophoresis complex mixtures of proteins and other biopolymers was developed in 1937 by Tiselius (A. Tiselius). Device Titulus and its various modifications, enabling automatically record the movement of the interface of each component in the mixture by means of special optical devices and special charts - electrophoregram (Fig. 2), is widespread for the study of normal and abnormal serum, establishing the composition of protein mixtures, to determine the purity of proteins. Fig. 2. Electrophoregram on Tiselius: 1 - normal serum person; 2 - plasma with multiple myeloma; 3 - serum when nephrosis. Zone electrophoresis is conducted in the environment of any indifferent media, such as gels agar, starch, gelatin, and special grades of filter paper. Especially widespread electrophoresis on paper (paper electrophoresis) in the study and the separation of proteins, nucleic acids, sterols, amino acids, fatty acids and other biologically active substances. Electrophoresis on paper is held in the fall of capacity of 15-20 V/cm and current 3-5 mA. The analyzed mixture (usually 0.01 to 0.04 ml buffer) put in a line of mid strips of paper, the ends of which the electrode is immersed in the solutions provided nepostizhimaya electrodes. After electrophoresis paper dried, if necessary, treated by a special reagent, coloring individual components of the mixture, which form several bands in accordance with the number of components. By the intensity of the color bars electrophoregram can be judged on the relative number of each component in the mixture. The microscopic method of electrophoresis is the definition of speed of movement in an electric field visible in the microscope particles and bacterial cells, red blood cells, particle suspensions and emulsions, etc. For microelectrophoresis use special microcavity fitted with electrodes.